My children loved Thailand and particularly Bangkok. This post is the first of a 2-part series on Bangkok with children. By the time we arrived in Bangkok we’d been traveling for two-and-a-half days straight and as well as being badly in need of a shower and a change of clothes we were also beyond exhausted. Some more than others of course: BigB seems to have endless energy reserves and I, having slept fairly well on the trains, was faring much better than Murph. After a lazy food-nap-food afternoon and evening there wasn’t much of a day left so we all turned in early. Bright and early on Day Two in Bangkok found us on our first tuk-tuk ride. Check out Murph’s cheesy grin above, we thought we were doing the tourist thing in style. What happened next is, as my friend Pam says, a tourist badge of honor. It was an experience that we’d rather not have had, a trap which most tourists fall into and in fact, was a good wake-up to the pitfalls of traveling in Thailand that we’re glad we had on our first day exploring the city. We instructed the tuk-tuk driver to take us to the river. I pointed out the boat dock where we wanted to go on my map. He nodded his head and smiled and then took us somewhere nearby but different. As we got out of the tuk-tuk we were shepherded to a ticket desk and presented with a “private cruise” for 2,000 Baht. After some negotiation we agreed on 1,500 Baht and were escorted to our waiting boat. I was just boarding when an older man came up to us angrily exhorting us to Stop! Stop! in rapid French. At first I thought it was a competing vendor trying to sell us a different tour but, Murph, who had been suspicious of the private cruise to start with and uncomfortable with the high price called me out of the boat to translate what this person was saying. In my pidgin French I was able to establish that the cruise vendor was grossly overcharging for a cold, uncomfortable ride up and down the river without any stops or guide explaining the sights along the way. The Frenchman and his family were waiting at the dock because they had called the tourist police to complain. We demanded our money back and thanked the Frenchman for helping to prevent us from making the same mistake. Less than ten minutes later we found the Chao Phraya Express and hopped on for a 15B (each), narrated cruise up to Wat Pho. Unwittingly we entered Wat Pho at a side entrance, something which turned out to be a perfect way to avoid the crowds in this busy temple complex. We ambled through the grounds soaking up the calm atmosphere and admiring the ornate buildings, tilework and statuary. 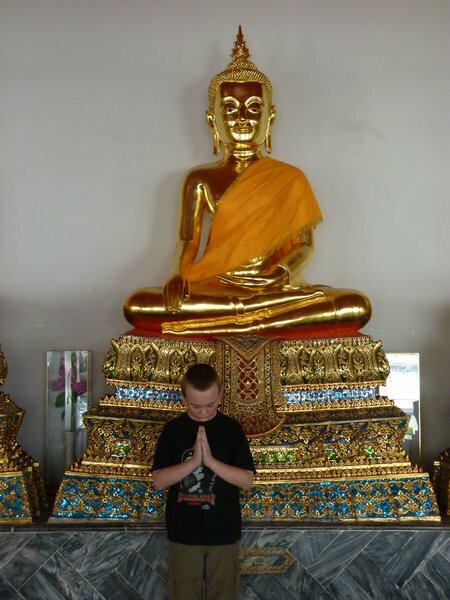 I’d been surprised by how the rows of statues, the scent of incense and the quiet of the temple had stilled my boys when we’d visited the much smaller Buddha Tooth Temple in Singapore. Wat Pho had the same impact for maybe 30 minutes and then they were done, pleading “Can we go now?”. I sent them off in search of the reclining Buddha telling them that they wouldn’t be disappointed. They weren’t. In fact, the only way to describe their reactions on entering the shelter where this 46m long statue lies is godsmacked. We joined the long, long line of tourists and pilgrims circumnavigating this Buddha and slowly made our way around. I was doubly glad that our visit to the Wat hadn’t started here in the shuffling, crowded melee of people. Sometimes it’s good to start at the end and work backwards. 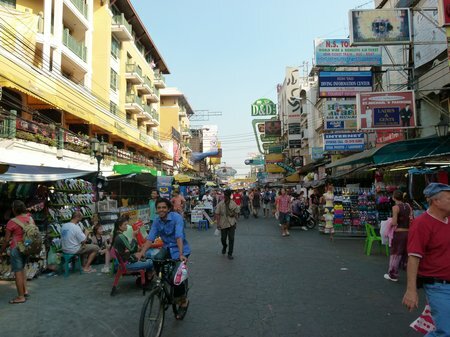 This is Khao San Road aka Backpacker Central, Bangkok. Since we weren’t staying in this area, we really had no reason to go there other than to see what this “party zone” was like. It didn’t disappoint. The boys worked their way down the stalls examining t-shirts and trinkets and enjoying the festival atmosphere. With such a concentration of stalls, bars and travel shops I was glad I’d opted for a hostel in another part of the city (Lub.d on Siam Square) but we had a fun couple of hours bargaining and shopping. On the tuk-tuk back to our hostel the driver aggressively tried to get us to agree to stop at a custom tailor shop but, having been duped once that day, we were a little wiser and were just as aggressive in demanding to be brought to our hostel and nowhere else. 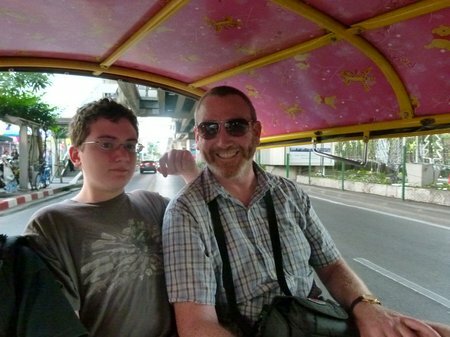 For the rest of our time in Bangkok we avoided tuk-tuks where possible – it just seemed a safer option altogether. This entry was posted in International Escapades, Thailand and tagged Bangkok, Thailand on January 30, 2011 by wandermom. You are a brave and adventurous family! Love the story! Glad you didn’t end up on the wrong boat. All amazing, per usual. I love to think of your boys finding that Buddha.